Take a cup of sugar. Add a scoop of costumes. Sprinkle in some excitement, energy, and adrenaline. What do you get? A recipe for a fun, but potentially out-of-control Halloween party for kids. If you're throwing a bash, you'll want to have some Halloween kids games organized to keep the party moving and your party guests grooving! Carving pumpkins is a great, traditional activity that is fun for everyone. 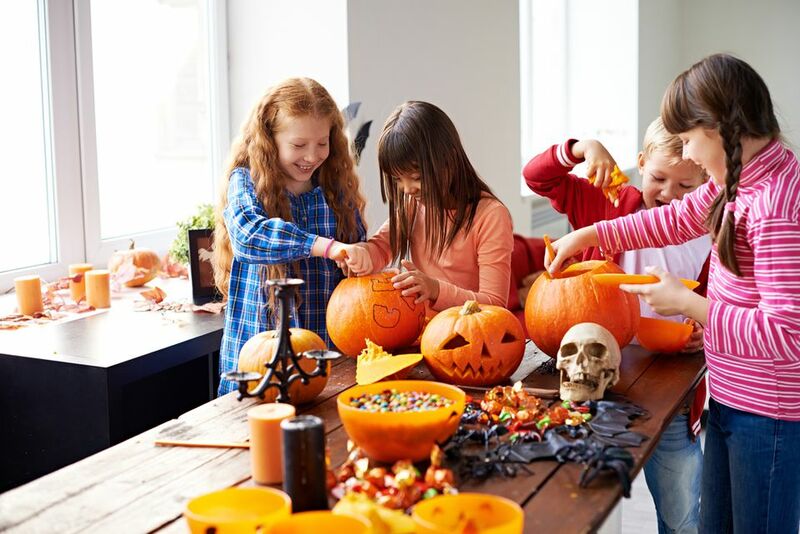 If you have enough adults on hand to assist with the carving process, you can have a jack-o-lantern making party, complete with a contest for whose is the funniest, scariest, prettiest and so on. Don't want the mess of carving pumpkins? You can still get crafty with pumpkins and get inspired instead by some of these ideas for decorating whole pumpkins for the fall season. Collect empty 2-liter soda bottles before the party. You'll need at least five and no more than 12. Spray paint the bottles white and paint on black eyes to create ghosts or spray paint them green and paint on faces to make Frankensteins or goblins. Set up the bottles as you would bowling pins, and have the kids take turns knocking them down with a mini pumpkin as their bowling ball. You can either keep track of the total score after several rounds or simply give the kids a small prize every time they get a strike. Toddlers will be thrilled just to knock over one or two, so give them a prize at the end of the game whether they got a strike or not. Divide the kids into teams of three or four. Give each team a roll of toilet paper or one roll per person, and then tell them to choose one team member to be the mummy. The kids must wrap the mummy in toilet paper as quickly as they can, and the first team to get to the end of their roll(s) wins. This game is similar to Mummy Wrap, but instead of making mummies, the kids are going to use the toilet paper to make a wedding dress on the designated team member. Give them 10 minutes to create their "dress," then have the brides of Frankenstein model their gowns, perhaps giving prizes to the team with the best creation. In addition to toilet paper, you could give the teams tissue paper, masking tape and other supplies to create the dresses. For older kids, hand out a piece of lined paper with a Halloween-related word or phrase at the top, such as "Happy Halloween" or "Haunted House." Give the kids five minutes to come up with as many new words from the original letters as possible, like "wall" or "peel" from "Happy Halloween" or "dent" and "she" from "Haunted House." Give the child with the most (legitimate) words a prize at the end. This classic autumn game is perfect for Halloween parties. Another Halloween game that has withstood the test of time involves hanging donuts from strings and having the kids race to see who can be the first to eat their entire donut with their hands behind their backs. Be careful about how you hang the donuts. It's best to wrap the string around something, like a tree branch, and tie it off instead of trying to stick the string into a ceiling with a tack, which could pop out and hurt someone. Freeze dancing is a simple game that kids of all ages love. Play a Halloween-related song, like "Monster Mash" or Michael Jackson's "Thriller." Tell the kids to dance like crazy and then freeze when the music stops (i.e., when you hit pause on the player). You could make this a competition, booting out anyone who wiggles or falls after you stop the music and then awarding a prize to the last dancer standing. Or, you could just let everyone play over and over again. Cut out a large pumpkin shape from orange paper and add a stem, eyes and a mouth but no nose. Tape the pumpkin to a wall, then give each child a triangular nose with tape on it that they have stick to the pumpkin while blindfolded. The kid who gets closest to where the nose should be, wins. Instead of everyone pinning a nose on one big pumpkin, you could make one smaller, plain pumpkin for each child. Tape the pumpkins to the wall and blindfold the kids, then have them tape the eyes, nose, and mouth to their pumpkins either one at a time or all together. You will need some adults helping you so no one bonks into each other. The Picasso pumpkins that result will make everyone giggle. If you've run through all your activities and you sense that the kids still have some energy to burn, throw together a quick fashion show of everyone's costumes. Have the kids sit in the shape of a long, narrow runway, put on some techno music and watch them strut their stuff.